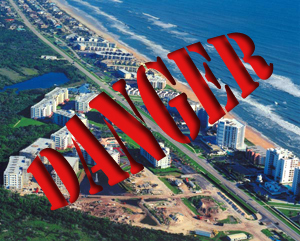 The Volusia County Government has achieved an almost farcical inability to keep their beach users safe. The Beach Safety website has ZERO mention of the obvious dangers posed by sharks in Volusia County waters. The Fear Beneath never received a response from Volusia County Beach Safety Director Kevin Sweat – perhaps it’s time to move up the chain of command if we want answers out of Volusia County. Shark attacks number 20 & 21 move us to within one of the record 22 in one year! Stay tuned to The Fear Beneath in the coming days as we demand a response from the Volusia County Government! Saturday, two people surfing off Ponce Inlet were bitten by sharks at the same time. Just after noon, a lifeguard reported that a surfer had been bitten by a shark. When they saw someone walking from the water with blood coming from his foot, they started treatment. Just minutes later, another person walked on shore, he too had been bitten on the foot by a shark. Ponce Inlet. Both were treated for minor injuries and released on the scene. These are the 20th and 21st shark bites in Volusia County this year.